The Military Court Martial on Tuesday morning sentenced 12 soldiers to death.They were among the 18 soldiers charged for mutiny on the 13 and 14th of May 2014 at the Maimalari Cantonment.The soldiers were charged with six count of criminal conspiracy to commit mutiny, disobeying lawful orders and various acts said to be inimical to the military service. 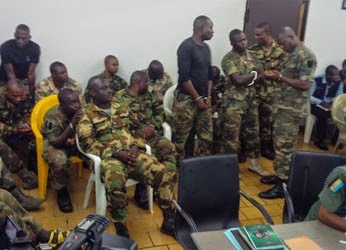 13 out of the 18 soldiers standing trial for mutiny and other offences, were found guilty by a military court sitting in Abuja, on Monday. Consequently, 12 of the convicted soldiers were sentenced to death by firing squad for mutiny, one was jailed for 28 days with hard labour, while five were discharged and acquitted. Those discharged are Naaman Samuel, Iseh Ubong, David Robert, Mohammed Sani and Sebastine Gwaba, while Jeremiah Echocho was sentenced to 28 days with hard labour. Others who were sentenced to death are Jasper Braidolor, David Musa, Friday Onuh, Yusuf Shuaibu, Igonmu Emmanuel, Andrew Ugbede, Nurudeen Ahmed, Ifeanyi Alukagba, Alao Samuel, Amadi Chukwuma, Alan Linus, and Stephen Clement. The soldiers were charged with six count of criminal conspiracy to commit mutiny, disobeying lawful orders and various acts inimical to the military service. The nine-member all military Court Martial headed by the President of the Court Martial, Maj. Gen. C.C. Okonkwo, found the soldiers guilty of insubordinate behaviour, use of abusive language, leveling false accusation against their superior officers, among others. The 12 soldiers sentenced to death were found guilty of three of the most heinous charges bars. Before their sentence, the legal team of the convicts had pleaded with the court martial to "temper justice with mercy," after narrating the pathetic stories of the family backgrounds of the convicted servicemen to the Court Martial team. One of the convicted was said to be the only son of his 80-year-old widowed mother, another, father of a five-month-old baby. The defence team in their argument prayed that giving them maximum sentence would do more harm than good, pleading that it would increase the agony of their dependants. However, they were found guilty of attempting to kill their erstwhile General Officer Commanding, 7 Division, Major General Ahmed Mohammed by shooting at his official car between May 13 and 14, 2014. They were found guilty of three out of the six count charges against them, which are conspiracy, mutiny and attempted murder of Maj. Gen. Mohammed. The incident took place at the Maimalari Barracks, Maiduguri in the course of the ongoing counter insurgency campaign. . The Maimalari Cantonment is the headquarters of 7 Division, the newest Division of the Nigerian Army. The court also found them guilty of preventing the movement of some of their injured colleagues to hospital and obstructing evacuation of their dead colleagues who were killed in ambush on their way from a operation in Chibok, Borno State.